View a video report, and interviews with MRG staff. Across the world, minorities and indigenous peoples are disproportionately exposed to hatred. From intimidation and verbal abuse to targeted violence and mass killing, this hatred often reflects and reinforces existing patterns of exclusion. The impacts also extend beyond the immediate effects on individual victims to affect entire communities – in the process further marginalizing them from basic services, participation and other rights. This year’s edition of State of the World’s Minorities and Indigenous Peoples highlights how hate speech and hate crime, though frequently unreported or unacknowledged, continue to impact on every aspect of their lives. The volume also documents many of the initiatives being taken to promote positive change and the different ways that governments, civil society and communities can strengthen protections for minorities and indigenous peoples. An exploration of key issues such as hate crime and hate speech, as well as ways to counter their prevalence. The dynamics of targeted attacks and hate speech in conflict situations, as well as the particular vulnerability of minority and indigenous women. A global examination of the legal standards in the area of hate crime legislation. 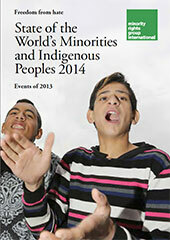 Peoples under Threat 2014 – MRG’s unique statistical analysis and ranking of the vulnerability of minorities and indigenous peoples worldwide.